Are you new to freelancing, considering freelancing or never had the courage to leave your job but would like to? If yes, please read on. I work with a number of companies, speak to friends who work in full time positions and teach students looking to move into a new career. I’m often faced with questions like how do you manage life as a freelancer? or don’t you miss the security of a full time job? My passion is to meet like minded people, do what I enjoy doing and have time to work on my own projects – this is why I work as a freelance creative. I won’t work on projects I don’t believe in and although I enjoy some more than others, I’m proud of my work/play balance. 1. Have a web presence: Do you realise how easy it is to have a website or blog up and running? 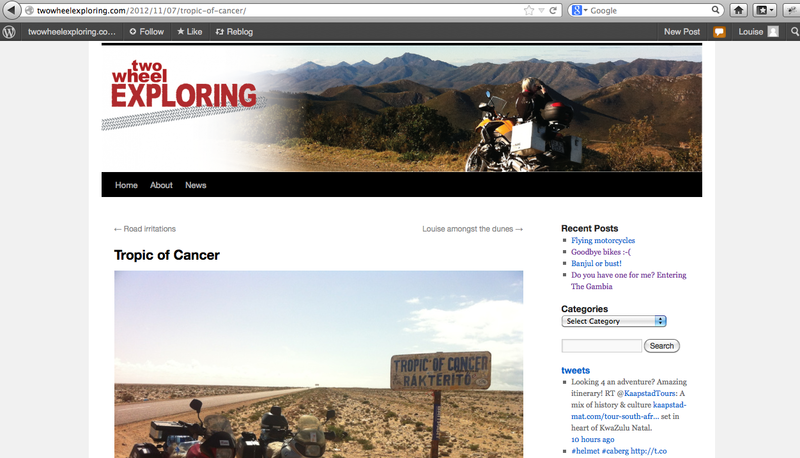 The joys of wordpress allow anyone to choose a name, change the colours, add some text and have a blog style website set up. This could either be used as a portfolio, an information point or have a point of view and keep an online journal updated. If you want to be more ambitious, you could learn to edit wordpress in more detail, in which case wordpress.org is a fantastic starting point. You will need to buy a domain name and pay for hosting (where as wordpress.com is a free, more basic service) but you will have the flexibility of editing the themes code base. If you want to know if a particular domain name is available, I recommend using Name Checker. It will tell you if the twitter handle, YouTube channel etc etc is also available for that name. Having a website is a great place for people to learn about you. Maybe they heard your name mentioned, did a google search or saw your thoughts on twitter. If you don’t have a web presence, how will a potential client or collaborator find you? 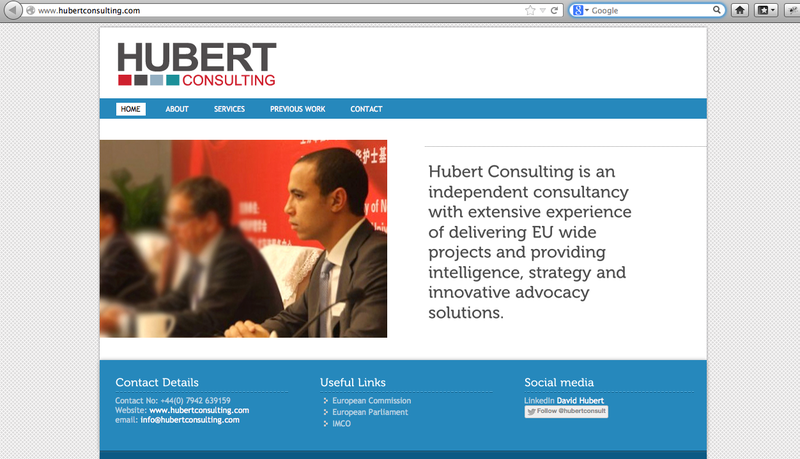 David Hubert became a freelance consultant at the start of 2013 and realised that if he wanted to attract EU and International clients he would need a website to explain his services. The domain HubertConsulting.com was available to buy and using wordpress.org (using bluehost hosting), a simple, clean website was uploaded to the internet. 2. Use social media: Get yourself on twitter. It’s the best tool for putting your name out to the wider world. It allows you to have a voice, share your expertise and ‘meet’ people from other backgrounds. Of course there is etiquette that you will need to learn (start watching how others compose their tweets), hashtags that will attract followers and ways to encourage more followers but more information on etiquette will have to wait for another blog entry! You can always use twitter to curate your news feed, reply to other people’s tweets or share new and interesting information for others. But don’t forget, there are many versions of social media you can use. I don’t use Pinterest for example but I can completely see the value if you want others to see your taste, understand your creativity or simply gain a better understanding of you as a person. Although you could choose to hide your tweets (I’m not sure why anyone wanting to promote themselves would do this! ), REMEMBER that anything you put on twitter can be seen by anyone, even if they don’t have a twitter account or follow you. Dokker.com is a tech start-up who have built a platform for allowing document templates to be shared. I did some work with Dokker.com to help them launch their product in the UK – we used social media to raise their profile. 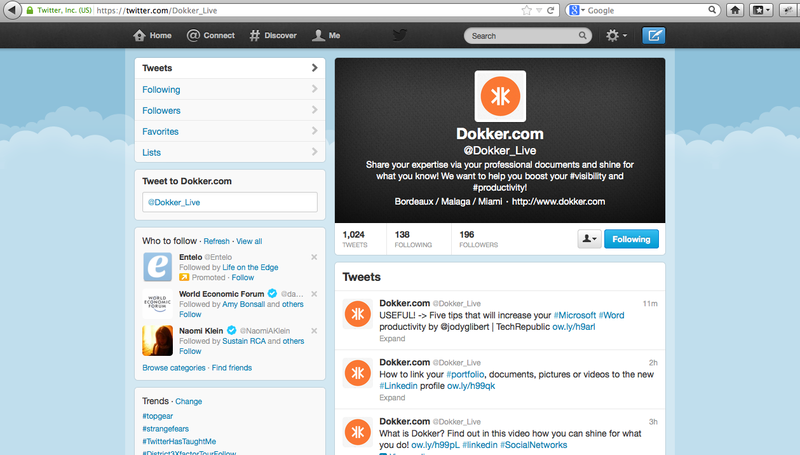 In a small amount of space it is clear what Dokker.com does through their description, their website link is visible and their account let’s you see their point of view through their tweets. 3. Collaborate with others: Freelancing is about being open to new projects and being creative means you are always curious. There are a number of online platforms which can be used to carry out pro-bono work and develop your own skills while helping others. I’m a big fan of OpenIDEO. The platform where people design better, together. Taking part in their challenges gives you exposure to real life briefs but gives you the flexibility of working on the brief when it suits you. Because the online community are there to help each other you will receive near instant feedback on your work and learn how others think! You can always take your skills offline and attend ‘Hack Day‘ events where a range of people come together to work on a creative brief in a short amount of time. Whether this is a whole weekend with socially conscious Good for Nothing, 36 hours at an IDEO Make-A-Thon or a service design focused event like the Global Service Jam you are guaranteed to meet inspiring people and be forced to test your creativity. REMEMBER though that if you are going to take part in an online community or attend a Hack Day, you need give as well as get! Your input is essential. 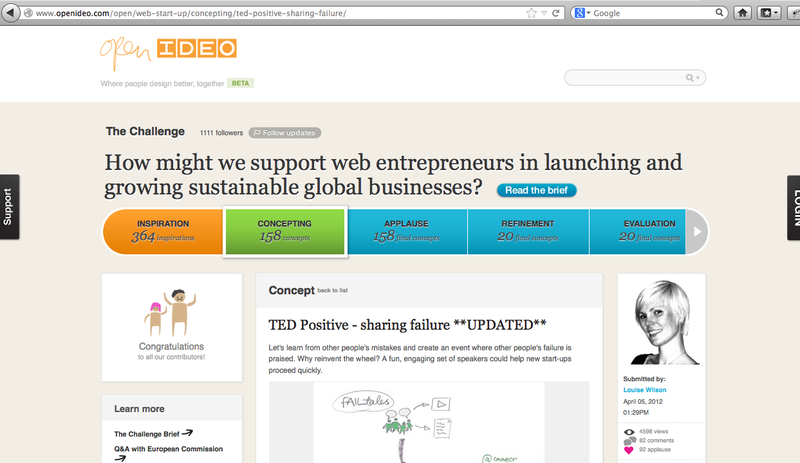 I took part in the OpenIDEO web entrepreneur challenge where they were looking for concepts to help EU web entrepreneurs be more sustainable. My concept ‘TED Positive’ (now My Fail Tale) was chosen as one of the 10 winners and was presented at the European Commission’s Digital Agenda Assembly. The best part of taking part in the challenge is that I have my own project up and running and I was lucky enough to meet some exciting and inspiring people while in Brussels at the European Commission. 4. Network, network, network: this does not mean simply giving out business cards (in fact, I don’t usually bother with business cards), it means go and talk to people. Online this can be done through LinkedIn or offline at events, talks or conferences. How do people know who you are, what you do or what you’re good at/your interests are if you don’t tell them? There are some fantastic places to look for events; look on company’s website or use eventbrite or MeetUp to find out what’s coming up near you. Use the event hashtag to focus your tweets, write a blog piece about what you’ve learnt or use the event as an excuse to meet people you haven’t met before in person. REMEMBER that you need to be confident and approach people if you want to network. There is no point in attending an event then sitting back hoping people will approach you. It is also essential that you too follow up with people you meet – drop them an email or link in with them. 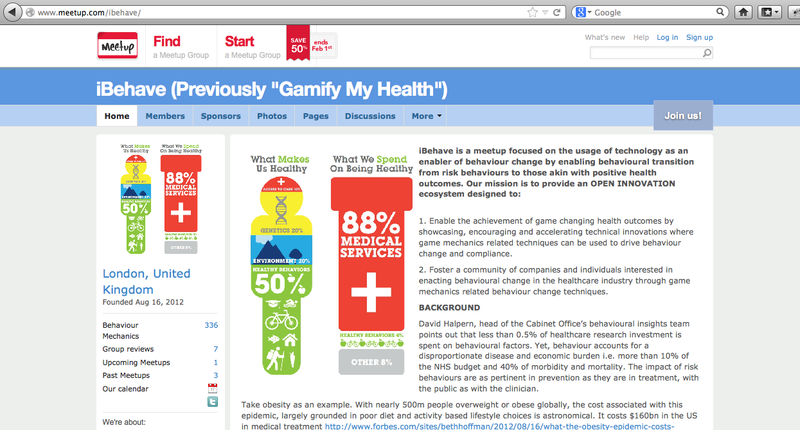 I have recently become involved with a MeetUp that is focussed on using technology to change people’s behaviours around health. We run a montly MeetUp and encourage a wide range of people from academics to entrepreneurs to developers and funders to attend. It creates a fantastic room full of inspiring people all interested in the same topic. The discussions are facinating and new connections are always made. 5. Learn what you’re good at: working freelance can make describing your job title that bit harder. You no longer have one strict job title and your potential to work across a number of projects is much greater. Do you know how to describe yourself or explain what you’re good at? Look at how others describe themselves and read other people’s blogs. Do you have ex-colleagues you could share your thoughts with to see if they agree? It is a good exercise to look over your CV or write down all the skills you have and also list all the skills you enjoy using. From these lists, start to sculpt a job description or a short bio for yourself which captures all of this and looks focussed. REMEMBER, whatever you write as your bio on your website, linkedIn account or Twitter profile, it can be changed! 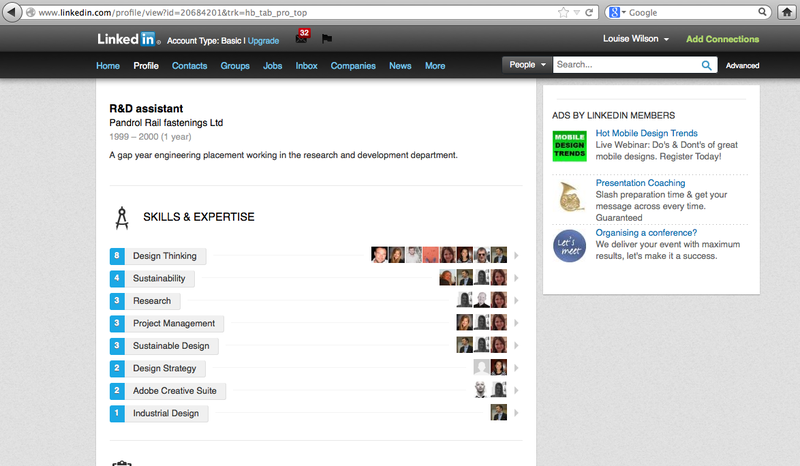 LinkedIn is a great tool for sharing your CV with a wide audience. Gaining recommendations from past colleagues helps to reinforce your skills and show potential clients what you are good at. The new ‘skills and expertise’ section that LinkedIn have recently introduced is a quick way to tell others what you are good at. You may find this a useful tool for self promotion. 6. Find a creative work place: When you work in a full time position, you are likely to have a desk, an office to go to everyday and colleagues to speak to on a regular basis. Working freelance can be a lonely experience for some people and it is important to build a routine that suits you. Maybe you enjoy working from home or maybe you miss the daily interaction with others. Luckily, with more and more start-ups appearing (especially in London) and more people becoming self employed, finding somewhere to work that has power points and WiFi isn’t difficult. REMEMBER, whatever way you like to work, make sure you create a working environment that suits you, not what you think you’re expected to do. 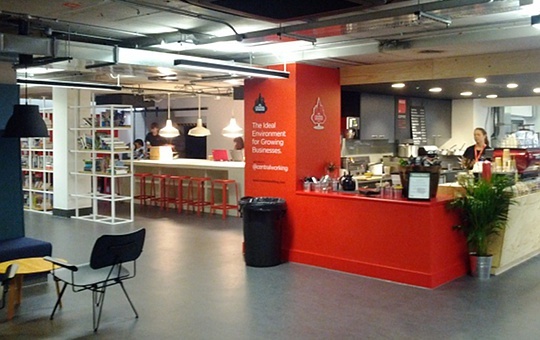 I have started to work at the Google Campus, central working cafe which is close to Old Street in London. Upstairs is TechHub, the shared working space for tech start-ups. It is a cafe which you need to register to use but once you’re inside is full of creative, like minded people. The number of tables is limited but the coffee is good and the atmosphere is perfect for me to sit and work. It can be noisey and sometimes a bit hectic but that is the type of environment I feel inspired to work in. 7. Combine your hobbies: I have a love for motorbikes. This is often news to people and not something you associate with a girl in her 30’s. The freedom that two wheels give you is unstoppable and riding on a motorbike often starts conversations with strangers – something else I love! I like to use my passion for motorbikes to take me to places where I can pick up new insights and learn from my experiences. 8. Learn new skills: In a full time position you may be lucky enough to be sent on courses for your own personal development. As a freelancer you need to do this yourself and these courses can be costly. Instead, why not attend events at organisations like General Assembly where you can learn new skills at affordable prices? There are plenty of online learning tools which could either help you brush up your skills or teach you something totally new. REMEMBER new skills will always look good on your CV but you will need to be disciplined to keep these skills fresh if you don’t have a freelance project to use them on. 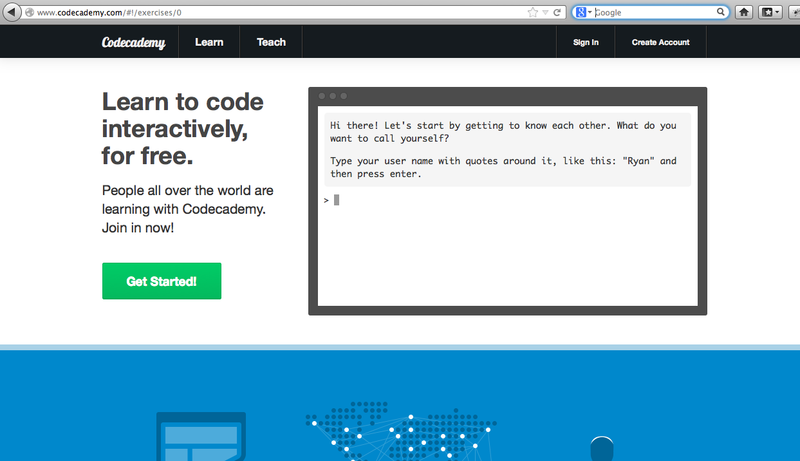 Code Academy is a very accessible online tool to learn how to code. You will be exposed to coding from the second you launch the website and soon realise how simple the site is. Once you have completed a few of the tasks you will begin to earn points which will motivate you to keep going. 9. Get good at doing your own tax: Having to file your own tax return is clearly one of the biggest barriers to people wanting to becoming their own boss. Ok, you can pay an accountant to do this for you (which is fantastic if you have the money) but I believe it’s important to at least do the first one yourself so that you gain an understanding of what’s involved. Don’t let people put you off doing your tax return by them telling you it’s complicated. It’s as complicated as you make it – the secret is to be organised and to set up a system for recording your expenses. I’m also often surprised at how few people use the HMRC website for help. I have called them a number of times and have always spoken to a very helpful person. REMEMBER there are also the HMRC webinars which are a good starting point for understanding how self employed taxes work. There are a number of tools on the internet which are designed to help you with your self employed tax return. 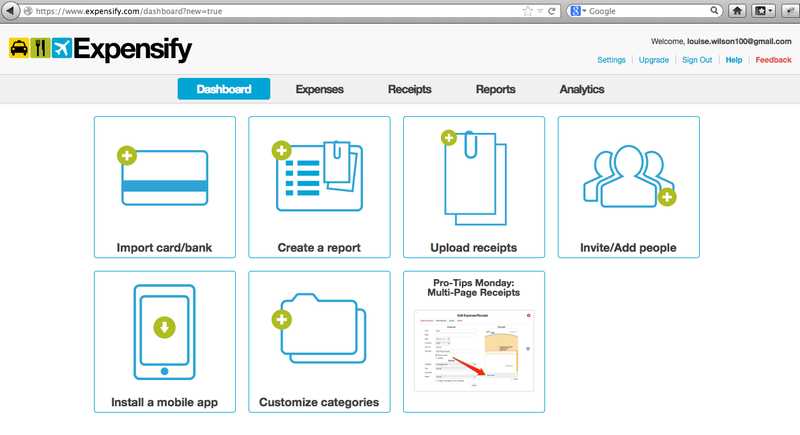 I recently read about expensify.com in the The Sunday Times as a tool to help you record your receipts. I recommend using any tools that help you! 10. Don’t get disheartened: when you first start looking for freelance work, you may not have constant work. This could easily happen between jobs too but remember that is the nature of working for yourself. You don’t have a boss anymore, no one is telling you what to do and you can choose the projects you work on. If you have a few days spare, work on your tax return, find a conference to attend, write a blog piece or go and do something non work related! I was cycling to the office on Thursday when I came across really bad traffic on the south side of Trafalgar Square. It is easy to get very frustrated when you see road works disrupting the traffic and I was all ready to complain to myself that any type of road work seems to take too long to fix when I saw a sign (unfortunately I wasn’t able to take a photo)…. a large, illuminated sign next to the works which said ‘waiting for a special part to be delivered’ – it made me smile! A very simple piece of communication changes an annoyance into an understandable problem. I wonder if the company doing the work have someone creative working for them or if enough complaints made a change to their service seem worthwhile!